Alexis is in her second year of the Master's program working with Dr. Walt Petersen on understanding how precipitation processes are modified by coastal mountain ranges, as viewed by both ground-based radar and space-based radar and radiometer. The goal of this research is to improve the retrieval algorithms used for the space-bourne instruments collecting data for the Global Precipitation Measurement (GPM) mission. Alexis graduated from the University of Illinois at Urbana-Champaign with her B.S. in atmospheric science and also completed a minor in German language and literature. This is her first time serving as an officer for the AMS chapter and she looks forward to accepting a new challenge while also leading and serving her fellow students and community as the president of the chapter. Outside of school, Alexis can usually be found playing soccer, cooking, or going out for ice cream. Jonathan is a sophomore Earth Systems Science major with a concentration in Atmospheric Science. During the past year, he was the Webmaster for the Huntsville area AMS chapter. Jonathan is friends with many members of the Meteorological community both across the state and across the country. He teamed up with some of them for a storm chase in May 2017 across the Southern Plains, the highlights which included witnessing a large tornado near Chester, Oklahoma and a textbook Low Precipitation Supercell near Roswell, New Mexico. Outside of classes and weather, Jonathan enjoys golf, bowling, eating Mexican food, and is an avid lifelong Alabama Crimson Tide fan. Jonathan is looking forward to continuing the chapter's high tradition of success. He is also hopeful that this year's chapter will also allow for new involvement opportunities for both the undergraduate and the graduate students. Lena is a PhD student who came to the Atmospheric Science department in Spring 2017. 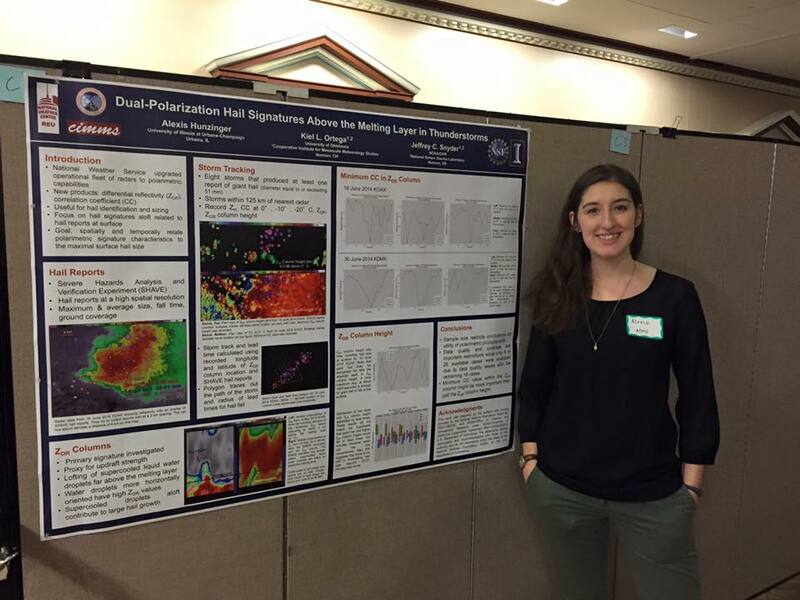 She is working with Dr. Walt Petersen on the association between extreme precipitation and lightning characteristics using observations from the International Space Station Lightning Imaging Sensor and the Geostationary Lightning Mapper on GOES-16. Lena is originally from central Montana where she graduated with a B.S. in Physics and looked at micro heat islands. She received her master’s degree from the University of Nebraska-Lincoln (UNL) in Earth and Atmospheric Science and looked at hail variability in supercells and how the variability related to environmental variables. When not busy with weather, you can most likely find Lena reading a book, working on a knitting/crochet project, or being involved with her church. She would like to continue being involved at UAH and within the department and feels that being an AMS officer will provide those opportunities. Caitlin is currently a sophomore undergraduate double majoring in Earth System Science with a concentration in Atmospheric Science and Physics with a concentration in Applied and Theoretical Physics. This upcoming year, she will be an Honors Mentor for rising Atmospheric Science freshmen. In between semesters, Caitlin enjoys storm chasing with some nationwide meteorology friends, which resulted in witnessing the Chester, Oklahoma tornado and the beautiful Roswell, New Mexico LP Supercell in May 2017. When she's not involved in weather, she loves sleeping, eating pizza, and spending time with friends and family. Caitlin is excited to help include more undergraduates in the UAH AMS chapter and help further its success. 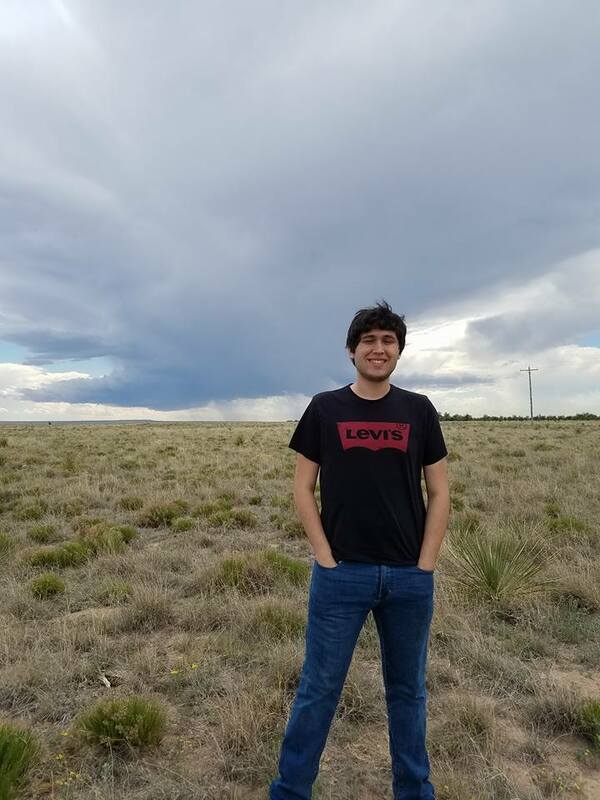 Andrew is a sophomore undergraduate student who is majoring in Earth System Science with a concentration in Atmospheric Science and minoring in Mathematics. 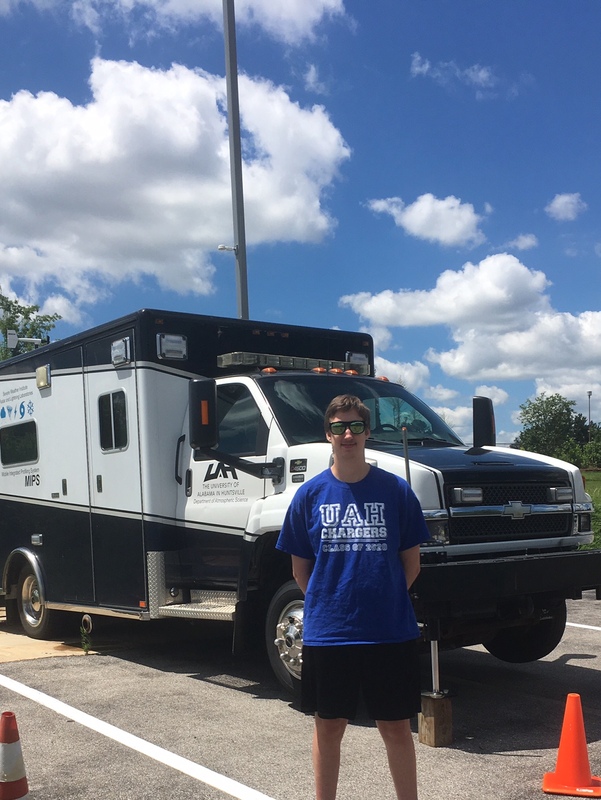 This is Andrew's second year as a member of the UAH AMS Chapter and his first serving as an officer. Andrew is also a member of the University Profile Sounding Team for Operational and Research Meteorology (UPSTORM). Outside of the classroom and weather realted activities, Andrew is a baseball and hockey fan and can often be found passionately supporting his hometown teams, the Chicago Cubs and the Chicago Blackhawks. Andrew is looking forward to serving as the AMS Webmaster this year and hopes to see the Chapter grow both in number of members and in the opportunities and events the Chapter provides. Dean is a sophomore undergraduate Earth System Science major focusing in atmospheric science. He joined the AMS chapter at UAHuntsville in the fall of 2016 as a freshman, and he served as the chapter's Undergraduate Representative beginning in the fall of 2017. Dean participates in the University Profile Sounding Team for Operational and Research Meteorology (UPSTORM), which provides fantastic opportunities for students to get involved in research operations. He assisted field data collection and analysis from the 2017 VORTEX-SE project and helped develop software that aided the quality control process. As Undergraduate Representative, Dean looks forward to serving his fellow undergraduates and encouraging their participation in AMS functions that will strengthen their relationships with graduate students at UAH.